MilitaryVetsPX.com - Personnelman PN for sale. 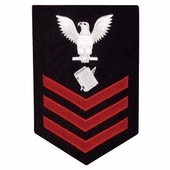 This is the appropriate rating patch for US Navy personnel with the rating of Personnelman PN1, PN2, or PN3. Navy rates are only sold as first class rates and can be cut to second or third class. Personnelman (PN) was a US Navy rating that merged into the Personnel Specialist (PS) rating in 2005. Personnelmen were responsible for maintaining personnel records and counseling enlisted Navy personnel in regards to training, education, and job opportunities.